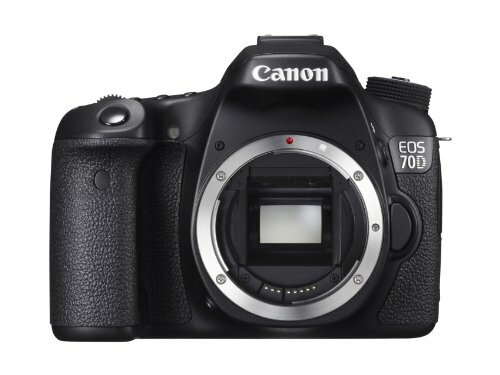 At first glance the Canon EOS 70D may look like just another DSLR. But it's oh so much more than that: the 70D wages all-out war against not only the rest of the mid-level DSLR market, but also has the technology to take on mirrorless models - often called compact system cameras - too. How so? There's a brand new sensor under the EOS 70D's hood that comes complete with a Dual Pixel autofocus system said to make it more proficient in live preview and movie capture modes. It's a DSLR for the new-wave. But the 70D hasn't forgotten its roots either: with stacks of top features on board - including a viewfinder-based autofocus system lifted from the well-respected EOS 7D - it sounds like a DSLR that's learnt from the best while adsorbing the best tech today has to offer. Despite its all-too-familiar external appearance is the 70D the DSLR to earn its stripes and land a rank above the competition? When we first picked up the EOS 70D it felt familiar. Yes there's a 70D badge on the front, but otherwise it looks and feels a whole lot like the previous EOS 60D. The latter camera was the model to almost trivialise Canon's tank-like build quality compared to the earlier 50D, in part to open up a greater point of difference from the top-spec 7D model. But the build isn't bad by any means. The near-pompous sounding "aluminium and polycarbonate resin with glass and conductive fibre" construction may sound a step towards almost meaningless, but this is tough, durable stuff - even if that's not the immediate hand-to-brain sensation that you might get. The 60D-smilar layout is eminently usable too. Or at least it is once you've set up everything within the lengthy 15-category menu system. Thereafter you'll only need to venture into the quick menu viaa press of the Q button on the camera's rear for the majority of settings, or dabble in the function-assigned buttons - AF, drive, ISO, metering and AF area/focus point - that surround the camera's light-up top-plate. We're big fans of this design. Throw in a tilt-angle 3-inch LCD with responsive touchscreen - the touch-based element makes for particularly good use when tapping into those quick menu options - and the 70D has one-up on many competitors, such as the Nikon D7100. The 70D embodies a little of the 7D's goodness too (probably no surprise seeing as it's five years since the earlier model's release). It might not have the same level of weather-sealing - although the 70D is quoted as having sealing on par with the 1994 EOS 1N release that, er, we'd all but forgotten about in the two decades since - or 100 per cent field-of-view optical viewfinder, but it does feature the same 19-point all-cross-type autofocus system. And it's autofocus where the 70D acts its strongest. If this is going to war then it's got a whole army of goodies to deal with different and trying scenes. But how does a 19-point autofocus system work alongside the Dual Pixel autofocus system that the camera introduces? Simple answer: it doesn't. Use the 70D via its 98 per cent field-of-view optical viewfinder - frustrating that it's not the full-on "what you see is what you get" view, as per the prime suspect competitor Nikon D7100 - and you instead get treated to the 19-point system. It's an all cross-type system, so both portrait and landscape orientation are equally sensitive. And by sensitive, it'd probably spot a hair on the back of your neck stand up: we've shot in bright sunlight through to shadier indoor conditions and had no problems whatsoever - you'll get the very best from the single or continuous autofocus systems with the 19-point system. The front-positioned AF area button can be readily reached during shooting due to its location behind the shutter button too. A single press brings up the various options within the viewfinder - so you you needn't remove the camera from your eye. Great for multi-area, group positioning or single point adjustment. The viewfinder also proclaims itself "intelligent": in a similar fashion to the 7D's it's able to present an electronic level, grid display and focus feedback - including confirmatory red illumination in low-light conditions - by using a screen overlay. This means non-permanent focus points that don't disrupt the view, or you can toggle the grid/level on or off as you desire. It makes for a clean viewing experience, and we'd take an optical finder over an electronic one any day of the week. This is approaching a best of both in many respects. Flip the camera into live preview via the switch on the rear and the 19-point system disengages. Instead the Dual Pixel autofocus system comes into play. But what does this mean? On the 70D's sensor each photo diode - which translates into a single pixel in an image - is split into two. This enables the comparison of left-side and right-side data at each pixel site to calculate phase-detection autofocus on the sensor itself. We were dubious the concept at first, simply because the Canon EOS M's on-sensor phase-detection autofocus was, well, rubbish when considered in context to the rest of the compact system camera market. Not so with the 70D. This is game-changing stuff that truly closes the gap between where DSLRs typically sit against compact system cameras. It just works. No focus-hunting, no faffing about. It's not as fast as something like the Olympus Pen E-P5, but the Canon still has enough pace and accuracy to please. Combined with the touchscreen controls - tap the screen, or or click and drag around to position the focus point to all but the outermost edges of the screen - and the autofocus is almost effortless to control. These outer edges are unavailable as the camera doesn't utilise the Dual Pixel AF in the outer 20 per cent of the sensor due to lenses typically providing softer results in these areas that would otherwise throw the overall focus out. On the downside, if we're being pernickety, the live preview will adjust the camera's settings for the preview stage only in order the brighten or darken conditions for best autofocus speed. So a scene may suddenly appear over- or under-exposed prior to focus being achieved, before settling down to an accurate preview - it's not uncommon for this to be seen, but it can be a slight off-put. Movie mode - which is typically controlled via manual focus for best results with most DSLR models - also reaps the benefit of this new autofocus system. There isn't another DSLR out there that can keep up with the smooth focus transitions and pace that we found apparent in the 70D. But that's in terms of pure DSLR cameras. As the market widens and technology becomes more vast than ever before there are obvious competitors out there. Things aren't as thoroughbred as before, though. The likes of the Sony Alpha A77 or A65 - technically SLT, or "Single Lens Translucent" models, not DSLRs - more than give the 70D a run for its money. If anything the speed of response in the Sony models is better, but Canon has closed down the gap to a decent degree. In use the ability to use the touchscreen is excellent and the autofocus sure is smooth, but it's not total perfection in this first version, however. The 70D's Face Detection + Tracking AF is the default live preview and movie capture focus selection, and with it comes an unpredictable response. We've been shooting close-up subjects only to find the camera would suddenly get more interested in the better-exposed background. On occasion it found an apparent face in the most unusual of places - the trees outside the 'Lint office windows, for example. Perhaps someone's spying on us. Who knows, eh? The solution is - most of the time, anyway - to pop the camera into single point AF where it's possible to then reposition the focus area in real-time during recording. It's a good solution, but the focus area size is broader and therefore more limited than the variety of options available from something like the Panasonic Lumix GH3. With the 70D continuous autofocus (AI Servo) is also active by default, but can be suspended at any moment by a press of a virtual button to the bottom left of the screen. Higher-spec users will bemoan the lack of live audio adjustment or monitoring due to the absence of a 3.5mm output. There's only a 3.5mm input for a microphone - but that's one big box ticked at least. Additionally with only one SD card slot on board you may find limits to how much footage you'll be able to capture before swapping the card out. Again we turn to the Nikon D7100 for dual SD card slots which we think is a better arrangement for overflow, backup or - as would be useful in the 70D's case - individual destinations for still images and movie clips. But no such luck in this Canon. But such nitpicks can't flaw what is new DSLR champion when it comes to easy and effective movie capture. Full manual control is available based on mode dial selection - including live shutter/aperture/ISO adjustment, albeit no 180 degree shutter for 48fps capture - there's decent 1080p quality at 30/25/24fps and the huge range of Canon lenses will obviously appeal. As per any stills camera, however, the 70D has to abide by the 4GB/30min maximum file size per capture - whichever comes first - rule, in order to fit into its alloted tax bracket. Something worth thinking about, but something no different to any of the competition. The 70D might not better the Panasonic GH3 or Sony A65, but where DSLR cameras are concerned the 70D gets so much right when it comes to easy movie capture. It'll see you pleased as punch. Movies are one thing, but it's still images that the 70D is primed for. We had our concerns about the new sensor's ability to cope with higher ISO settings based on its structure - as there are not 20.2-million sites of data, but double that due to the Dual Pixel AF system - and, therefore, the greater demand placed on the processor. Fortunately such issues are unfounded. The 70D's 20.2-megapixel output means a slight push in resolution compared to the 60D's 18-megapixel offering. Quality-wise the results are similar from both cameras, only there's the extra physical file size and dimensions offered up by the 70D. Bigger files, similar quality - we'll take that. If you're a 60D owner looking for a massive quality bump, however, then don't get overexcited - you'll probably need to go full-frame for that. But that's the state of cameras these days: sensors are pushing forward little by little, but generational differences are often subtle. We've been shooting with the 70D at London's Queen Elizabeth Park using a multitude of lenses. We've connected up the 24-70mm f/4 macro, 24-70mm f/2.8, 8-15mm fisheye, 70-300mm f/4-5.6 L-series and - wait for it - the 800mm f/5.6 L-series, in order to get a full spectrum of what the camera can do. The full ISO 100-12,800 (25,600) range is wide but isn't class-leading at the highest of ISO settings. Surprisingly we feel that the Nikon D7100 performs better here, despite its higher resolution, but the Canon's clean results - we didn't spot any banding in the shadow areas, unlike with the Nikon - earn it Brownie points. The lowest ISO settings are great though. Faithful, colourful and often well exposed - although sometimes the 63-zone dual-layer metering opts to overexpose, dependent on the scene - there's plenty of detail available throughout the frame. We were happy with shots under the four-figure ISO ceiling: an 800mm snap of a park attendant at ISO 640 is full of detail, beautiful bokeh and crisp detail (as shown above). In part that goes to show what a £10,500 lens can do we suppose, but it's also a thumbs up in the 70D's versatility - go with a kit lens, upgrade to something a bit better, or go the whole hog and buy something mad-expensive (but brilliant) and this is a camera that'll see you out whatever you're using. We'd call it Canon's current top APS-C sensor camera if anything, even if it's not supposed to be. Above the four-figure ISO threshold and results are still decent, even if there's some more image noise to be seen. Much higher sensitivities - such as a gymnast shot between ISO 5000-8000 - resulted in more limited results. We felt that the noise reduction processing was a little coarse at such sensitivities, often not bringing a great deal of benefit to the image compared to the more detailed, yet grainier raw file. A deft touch of personalised raw file processing could get plenty out of the files, but when it comes to ISO 6400 and above we'd rather hold back - there's just not the crisp detail available here. Take note wildlife and gig photographers. Just as per the EOS 6D, the 70D includes Wi-Fi control for both remote control and image sharing via a smart device. It's quick and easy to activate Wi-Fi from within the quick menu, but the overall setup process is a lot more long-winded. Once you've fixed everything up there are rewards to be had - the remote control via an iPad, for example, being among the most fun, despite the predictable lag that Wi-Fi brings meaning that "decisive moment" is far more likely to be the "missed moment". As with so many camera manufacturers the 70D's Wi-Fi feels to be a "nice to have" feature rather than that perfectly implemented essential. Samsung still leads the way in this area - just take a look at the Galaxy NX - and with Canon forcing Canon Image Gateway sharing - Facebook, Twitter and email shares are half-hearted links that redirect back to the Gateway - we left Wi-Fi well and truly off after going through the process for test purposes only. Nice ideas, but in need of simplification and improvements, plus the impact to battery life isn't desirable. Elsewhere it's easier to sing higher praises of the 70D. Even though it doesn't claim to be a "professional" camera there's a whole lot on offer that begs to differ. What's stood out about this camera is its all-round top performance. It's a star in almost everything that it does. The 7fps burst mode makes it a breeze to whirr through full-size shots. With raw + JPEG Fine selected - and a Class 10 30MB/s SD card installed - we snapped through eight frames in just over a second, waiting a mere five seconds for the first to show on screen; seven seconds in total for all the files to write to the card. It's a frame per second quicker than the Nikon D7100, and only slightly behind the 7D. Battery life lasted out a treat too, there's a 1/8000th sec top shutter speed and built-in Speedlite flash control. And it's not pro-spec? Who ya kidding, Canon? If you're after a solid all-rounder then the 70D looks to be a 7D killer in many respects. Both cameras are available for exactly the same price at the time of writing - the 7D significantly discounted in the years since its release - which makes for a curious proposition. To us it smells like the 7D mkII has to be just around the corner to elevate Canon's APS-C offerings yet more... But that's a whole other story. The 70D represents the DSLR in the post-mirror age. If you're looking for an all-rounder when it comes to both still images and movie capture then there's no other pure DSLR out there that can offer such a varied and successful feature set. It's the camera's autofocus systems that win out though. The Dual Pixel AF system truly closes the gap on the compact system camera market when used in live preview and movie capture modes, while the viewfinder-based 19-point cross-type autofocus system works swiftly in both single and continuous autofocus. We've been genuinely impressed how each system works independently depending on how you use the camera - and there's no compromise for one or the other. A revelation when considering how poorly the Canon EOS M functioned. It's a shame that the 70D's viewfinder doesn't offer a 100 per cent field-of-view, but otherwise a strong feature set - including that 3-inch, tilt-angle touchscreen - counters at almost every other avenue. Great new technology, great image quality, and great in use - there are only a few nitpick shortcomings to the Canon EOS 70D. Otherwise it's as close to redefining the mid-level DSLR sector as we've seen in recent years. It sure does earn its stripes; this is the colonel of cameras and deservedly so.